In the next holiday season, the successful free online program ‘Spiritual Christmas’ will be held for the second time. 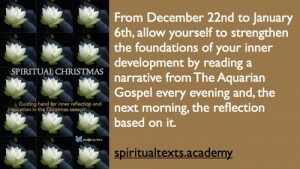 From December 22 to January 6 you can read or listen to chapters from The Aquarian Gospel and reflecions about them. 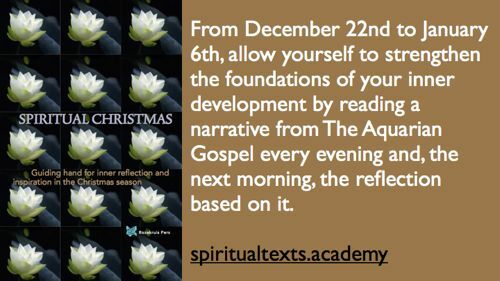 All texts are published in the new book Spiritual Christmas – guiding hand for inner reflection an inspiration in the Christmas season . Register yourself and receive the daily e-mails with links tot the texts for free. This entry was posted in christianity, Christmas on 12/07/2018 by Administrator.